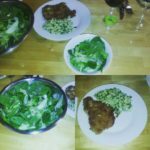 German Spaetzle Dumplings, Wiener Schnitzel, Spinach Apple Salad. Translation of the name: 'Wiener' this word comes from the word 'Wien', which is the Austrian city called Vienna. 'Schnitzel' means basically meat in a crust. For this class we will be using Pork, if you'd rather Chicken, please note under allergies when you register. All Adult Classes come with Sangria, appetizer and dessert.